The thunder of the crowd roared just ahead, thousands of spectators and runners alike screaming in unison for one person and for everyone. Each step squeezed out a tiny splash of sweat and rain as if I had strapped sponges to my feet. The sound of the sloppy metronome kept time as the blue finishing banner crept ever closer. 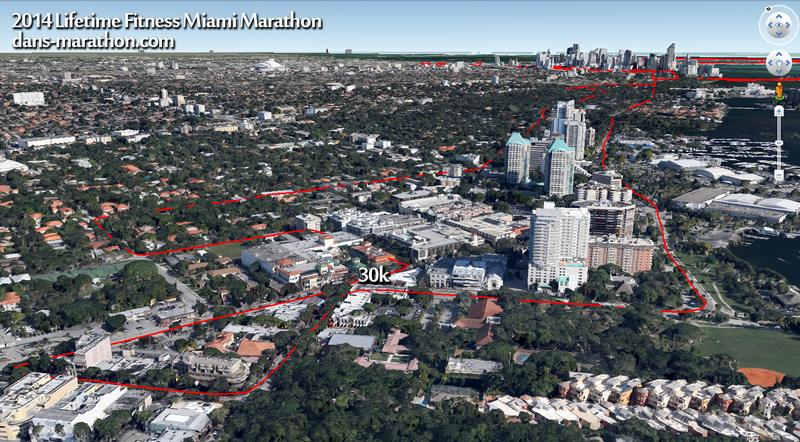 I had twenty-six miles behind me and in just a few seconds I would notch my twentieth marathon and one hundredth race. I had struggled to get to this point. The dark morning was warmer than it had any right to be in January, the air was thick and felt completely alien. For the last month, Chicago, like most of the country, had found itself in an arctic love affair, icing its denizens on a daily basis and keeping even its most dedicated athletes indoors. With only a precious few pauses in the petrifying chill, I was limited to only three outdoor runs all month, all of which left me with pink, frozen fingers. But right at the border between Georgia and Florida, blues and purples suddenly erupted in orange, as if the southernmost state were in a protective bubble. 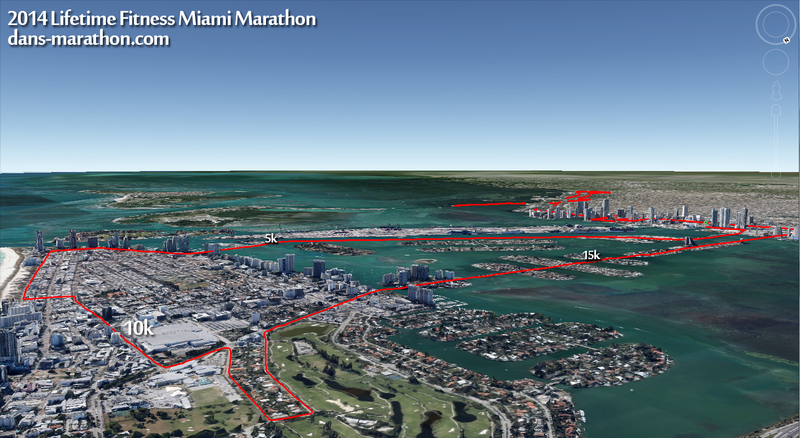 The weekend before the race, the difference in temperature between my training ground and Miami’s race course was literally one hundred degrees. I knew before even arriving in the Sunshine State that I would face a steep challenge. 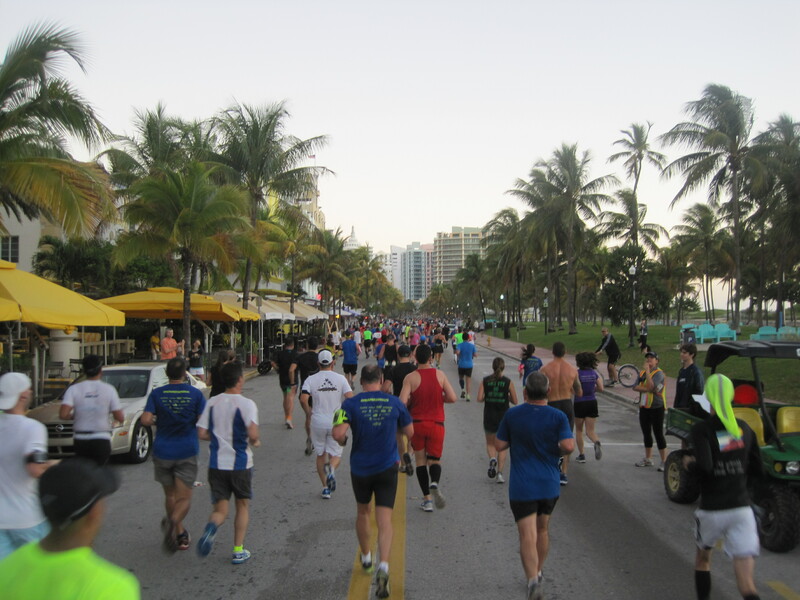 Training had not gone superbly for the 2014 Miami Marathon but that didn’t stop me from starting. But as I pushed onward, past the cruise ships on the MacArthur Causeway, through the cool breeze on Ocean Drive, while hopping over island communities on the Venetian, under the resplendent towers in downtown Miami, through the morning parties in Coconut Grove and into the last-minute rain, I was thinking of something else. I wasn’t thinking of my breathing, nor was I focused on my legs. 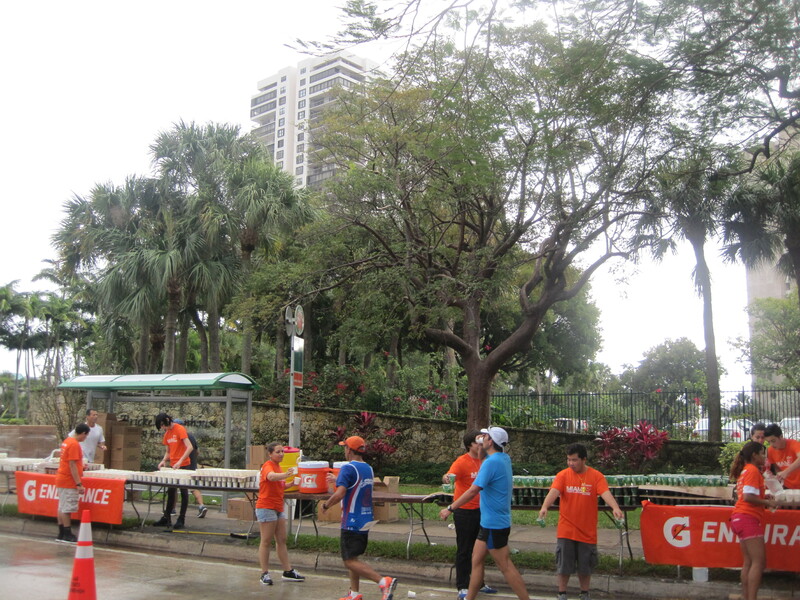 I could have been taking in the sights, the sounds and even the smells that surround the flood of runners every year. In a city with so much to occupy the outward senses, I found myself taking an inward stroll. Late last summer, my uncle was diagnosed with glioblastoma multiforme (GBM), a malignant and very aggressive brain tumor. As is the case with anyone diagnosed with the disease, the prognosis was grim. Few people survive with the tumor for longer than a year, there is no known treatment for it and very little known about how it forms. Although it tends to be more prevalent in Caucasian males over 50, it often feels like an unlucky roll of the dice. Two months later, on the morning of November 25, tío Daniel passed away in his bedroom, surrounded by his loved ones. I wasn’t particularly close to him. He had a quiet demeanor that was often overshadowed by my louder, more gregarious uncles. I knew him more by his interests than the deep-rooted convictions that make a person who they are. He loved to mountain bike, travel to exotic places, try and cook amazing meals. 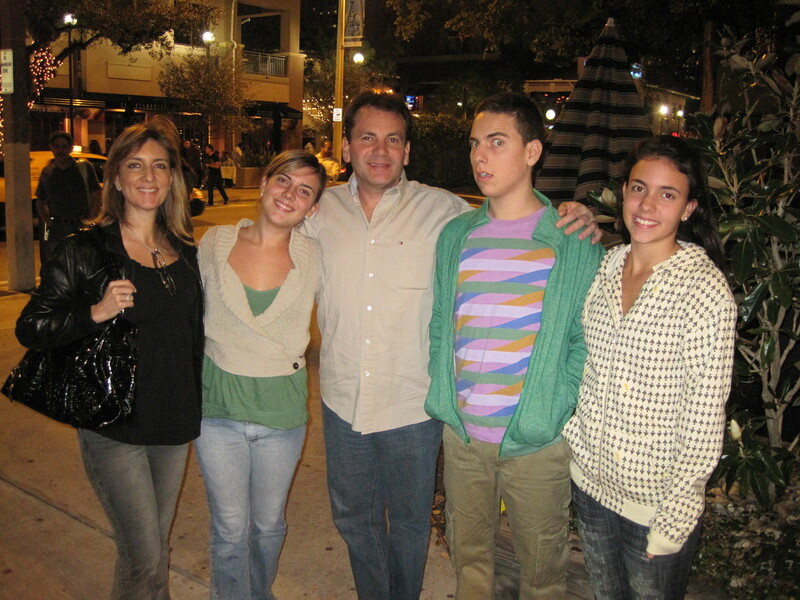 He was a precise and effective businessman, a devoted father and loving husband. My aunt has always been my second mother and I regard their children as my third, fourth and fifth siblings, so while I never shared an intimate connection with him, I truly felt like I lost something profound that day. So as I crossed the finish line, I completed my tribute run. In early December I joined the American Brain Tumor Association’s Team Breakthrough and with the help of co-workers, friends and family, we raised over $2,000 for the organization in tío Daniel’s memory. These funds will go toward patient care and research towards a better understanding of this fatal, yet poorly understood disease. I walked under the banner with my hands digging into my waist, breathing less air with every heave. I was no longer thinking of my uncle but instead of my aunt and cousins. I was overcome with emotion at the simple thought of having to refer to your father in past tense, at acknowledging that life has changed forever. But while they have certainly lived through terribly painful days, I know that my family will continue to push onward happily in his memory. If there’s a silver lining to the untimely passing of a loved one, it’s the blunt reminder to enjoy and spend time with the people that surround you. The day before, I drove out to North Palm Beach with my father-in-law and his brothers to visit their aunt. Though she was hard of hearing and used a walker to move herself around the apartment, her mind and wits were still as sharp as a sword. Amid the updates and funny recollections, she urged us, as a sage matriarch in her twilight years, to do what made us happy, to fulfill our grand to-do lists and enjoy our time while we still had it. Because the end of that time is uncertain. I want to offer my sincerest and heartfelt thanks to everyone who helped me with my fundraising, to those who sent kind condolences, to friends who called and family members who have stuck by me as long as we’ve known each other. Your unconditional support has truly humbled me and I am honored to have you in my life. 1. 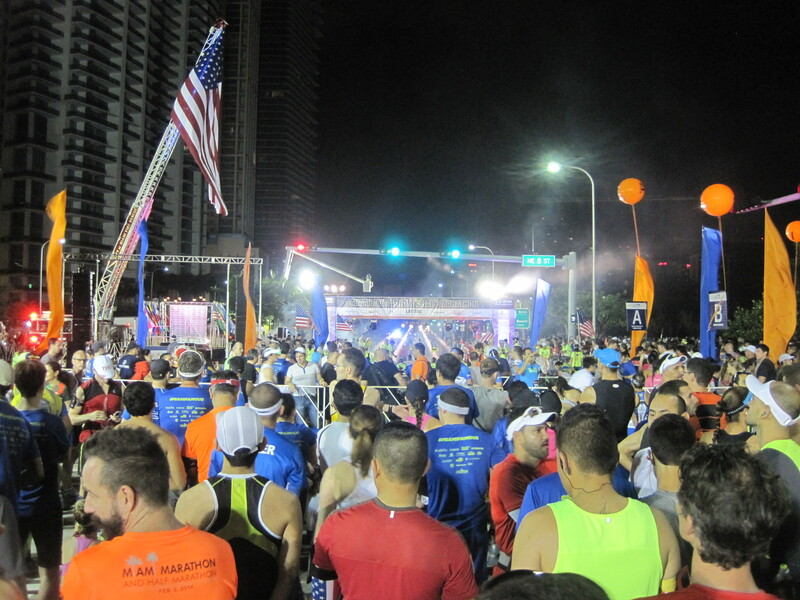 The starting line of the race at 6:15 AM. The national anthem was played in a sultry jazz style by Ed Calle and almost all announcements were in English and Spanish. 2. 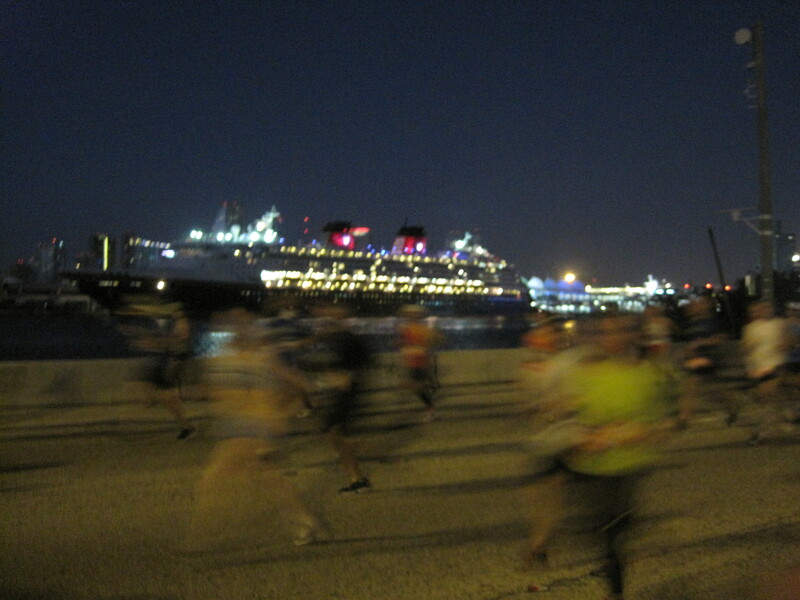 Enormous cruise ships keep watch over runners as they run over the MacArthur Causeway, a bridge that starts with the race’s longest and highest climb. 3. 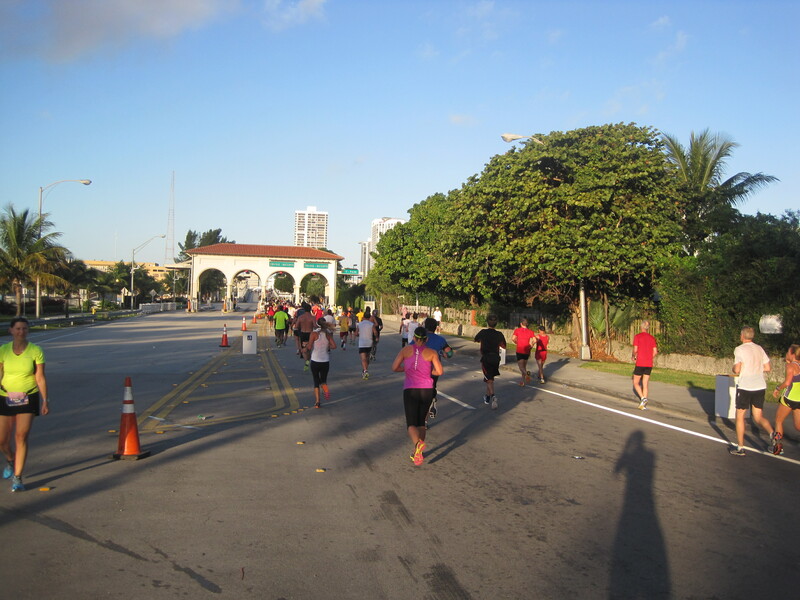 Just past the 5K mark and one more slight incline, runners enter the south side of Miami Beach. The run is rising quickly ahead and we’re all eager to put it behind us. 4. 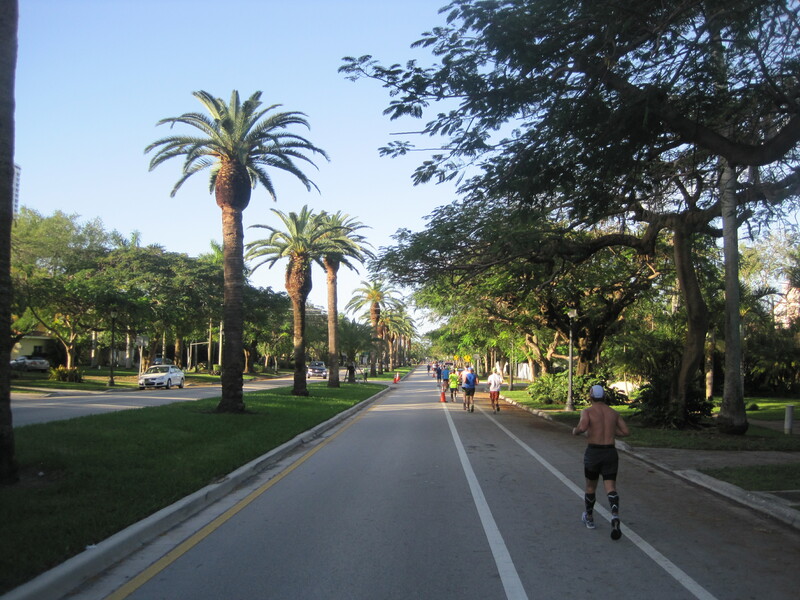 The northward stretch on Ocean Drive single-handedly embodies Miami and the reason this race is so popular. Classic hotels and restaurants face the open sea, with many spectators out, making noise. 5. 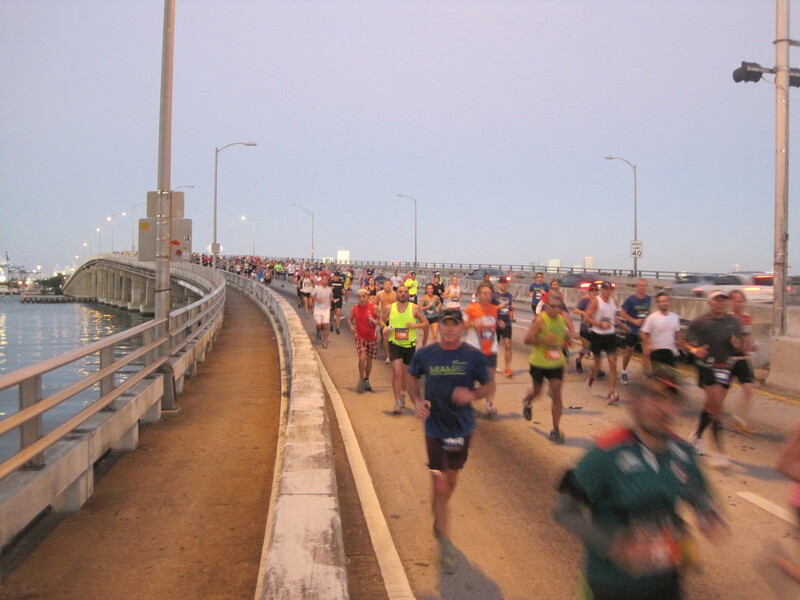 Returning to the mainland via the Venetian Causeway is equally gorgeous, with some parts of the race being so narrow, you feel surrounded by the ocean. 6. The last “check point” before reaching the main land, runners have run about ten miles at this point. 7. Three times I’ve made the left turn, ready to be done. Today I would follow the path unknown, away from the city and the roar of the crowd. 8. 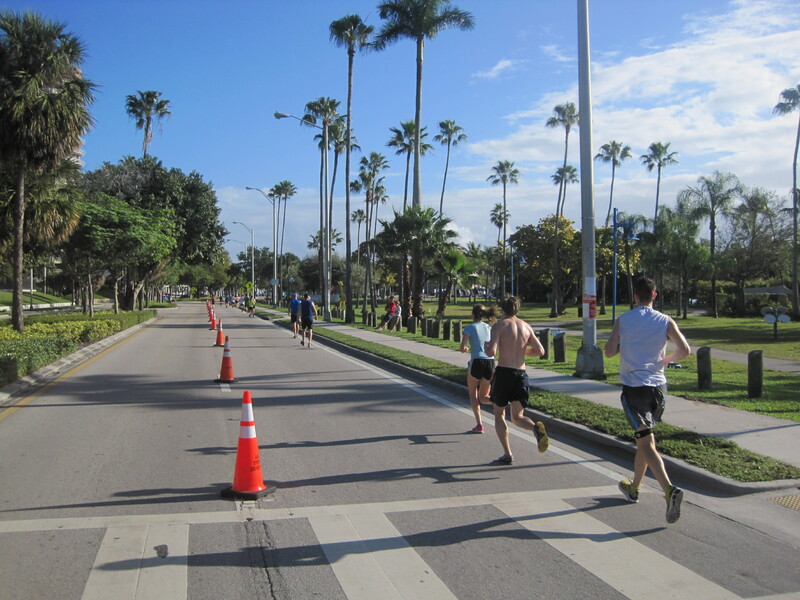 Although the marathon course would be far less crowded, both with runners and spectators, the sights were no less beautiful. 9. 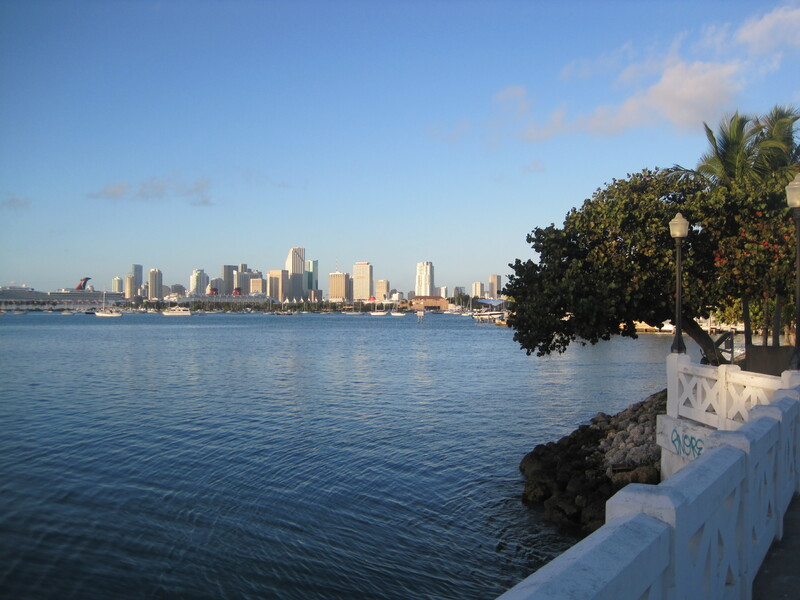 Just past Coconut Grove and the 30k mark, the sun is out in full force as we pass Bayside Park, on our way back to the city. 10. 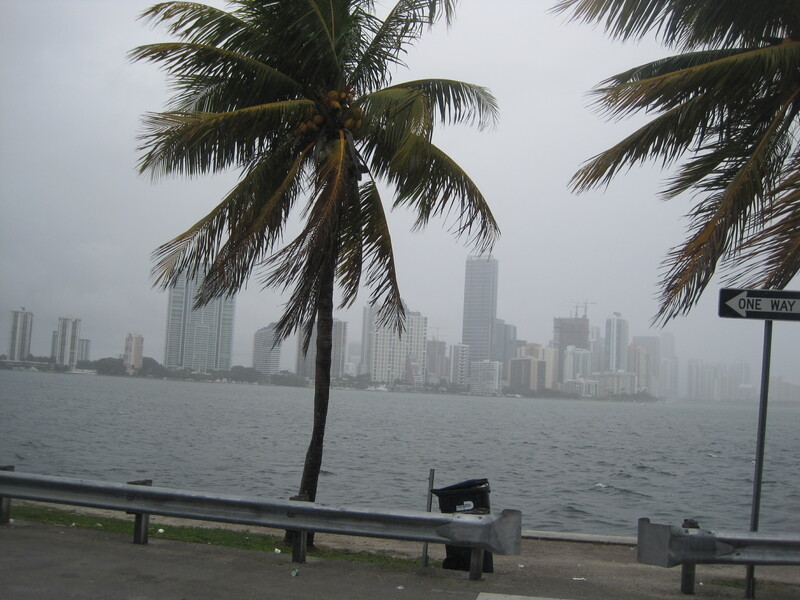 Clouds and rain made a much-welcomed appearance as we tackled the needlepoint out-and-back on the Rickenbacker Causeway. I rarely race in rain, but this brief shower certainly helped me out on this section, which most runners describe as the worst part of the race. 12. 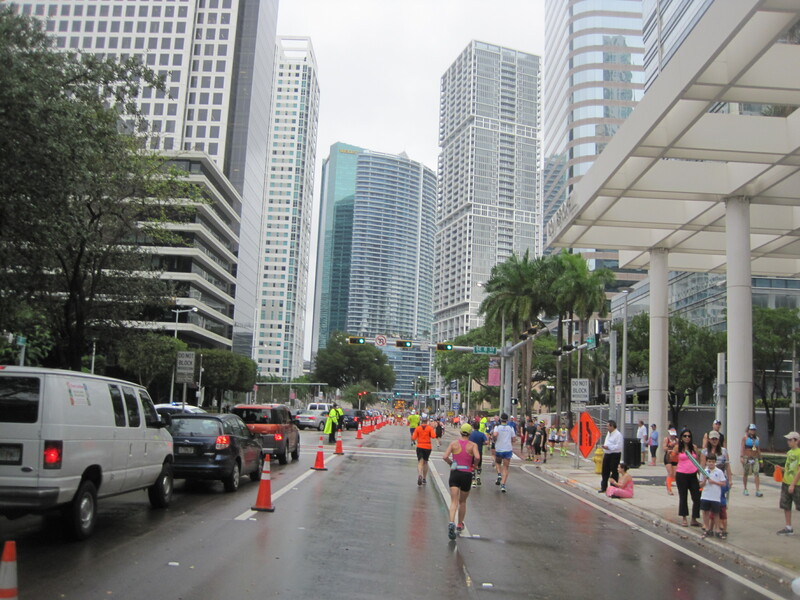 After a straight line down Brickell Avenue, the last mile is in the heart of downtown Miami. Feeling tethered to the finish line, I somehow managed to pick up the pace. 13. 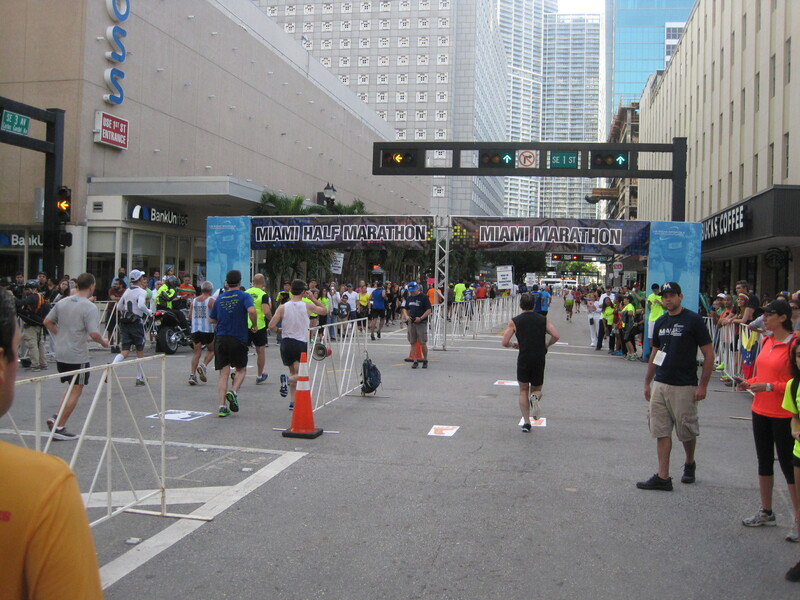 The finish line of my 100th race, where just seconds after finishing, I found myself dizzy and almost losing my balance. Commiserations for your loss. 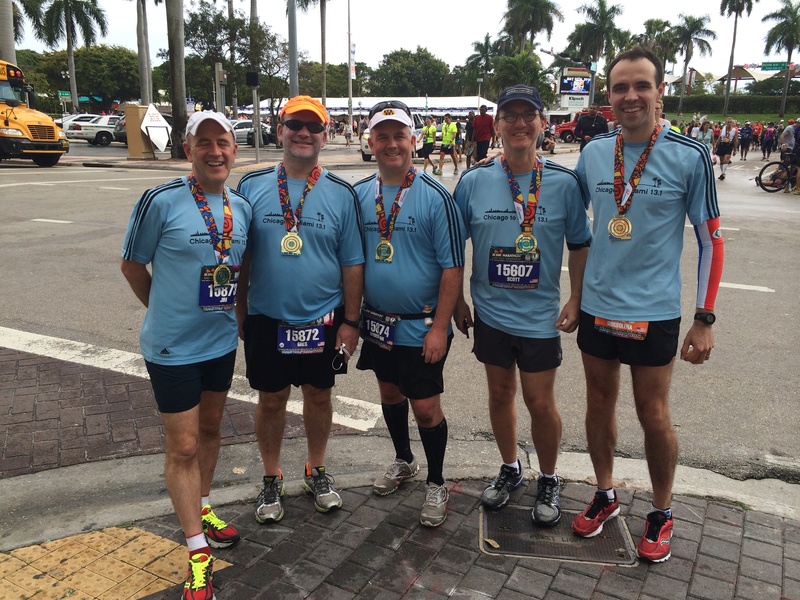 Your achievement in finishing your 20th marathon and 100th race is a fitting way to celebrate the life of your uncle. Fantastic post, Dan! Well done. Strong as we are in the prime of our lives, very few of us will ultimately go out on our own terms. All we can do in the meantime, it seems, is respect the Golden Rule while forging a life we can be proud of every day, so when our time comes we leave behind a lasting legacy that pays it forward. Clearly your uncle succeeded on all counts. As a biologist I always cringe to read the words “fatal” and “poorly understood” together. But the fight will continue until the fight is won… and when GBM does eventually succumb to the steamroller of biomedical progress, it will owe its demise in large part to the altruism and resolve of individuals like you. Thanks for writing, Dan. Congrats on marathon #20 and race #100, and on a sterling tribute to your uncle who I now feel I knew in some small way. Best wishes to your family going forward. Rest in peace, Tío Daniel. Well put, Mike. I suppose with running long distances comes that ephemeral (but invigorating) feeling of invincibility — a feeling that is then doused in cold water when you realize how delicate and vulnerable we all are. Thanks for the kind words. Congrats on the 20th/100th milestones. Your report shows your heart and dedication. Estoy seguro que Tío Daniel estaría muy orgulloso. Gracias por el comentario, Jeff (Chéfri?) – la realidad es que la carrera la corrí por mi tía y mis primos, pero me gusta pensar que a mi tío hubiera apreciado el gesto. And it seems that you have your own 100-related milestone this year. Big challenges ahead. Beautiful post, and tribute to your uncle! Congrats on your 20th marathon and 100th race! Love the way you dealt with this, my friend. Thanks for the help and support Mr. Tang. There’s a lot that could be said in response to this post, but instead I keep thinking back to one of our conversations from this past summer about how unexpectedly emotional running can be. Running forces us to acknowledge our own humanity and helps us to understand who we really are. I can’t imagine that your uncle would be anything but proud. Thanks for sharing. Indeed, MB, indeed. While I definitely use running as a way to structure my weeks and months, it does have its concomitant effects. One of those is definitely the many emotions that we face during those long 3+ hour runs. But this was the first time that I faced them head-on like a brick wall at the finish line. Even in the toughest races, including North Country, when I was done, it was mostly relief. 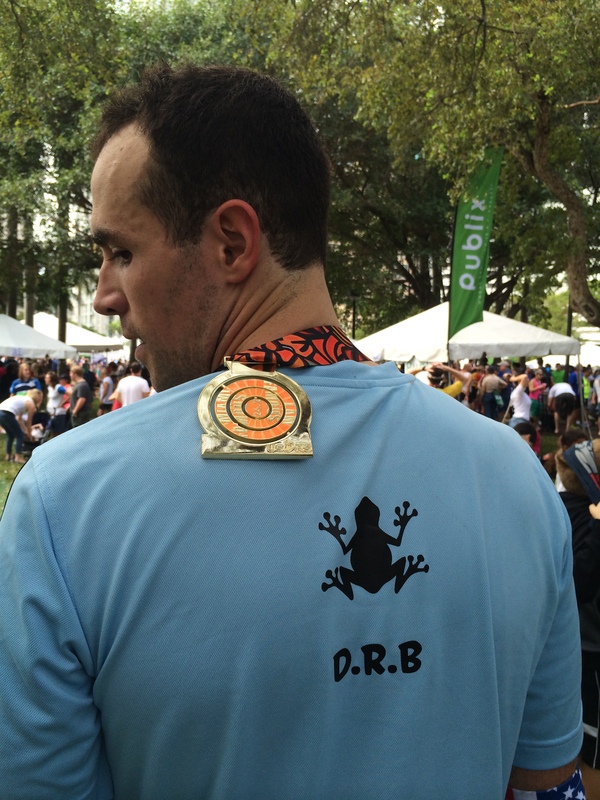 What a great run: I think this is such a wonderful way to celebrate life after mourning a loss. Thank you for sharing this amazing story in your post, it is truely inspirational. I agree whole-heartedly with what’s been said many times: I’m sure that Tio Daniel would be honoured and proud of you all. Thank you for the kind words, FMR. There is something to be said about running — facing each step with determination and alacrity — that I felt was a fitting tribute for the passing of a loved one. I hope that came across in this post. 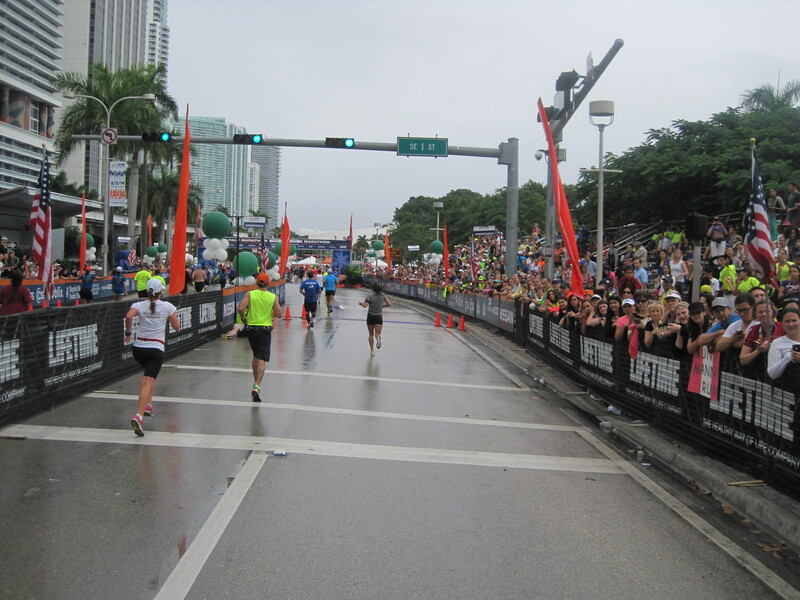 Crossing the finish line is always an interestingly emotional moment for me, so I can only imagine how emotional it must have been after finishing 26.2 miles in honor of someone who just passed away. 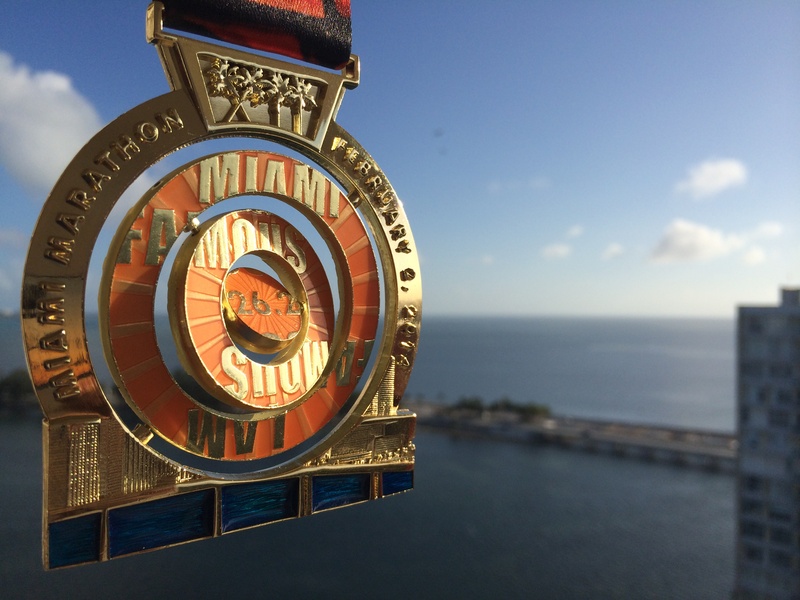 Dan, this was definitely a great tribute: one of the best ones I can think of a runner can offer. Thanks Laszlo — I don’t get worked up upon finishing big races. 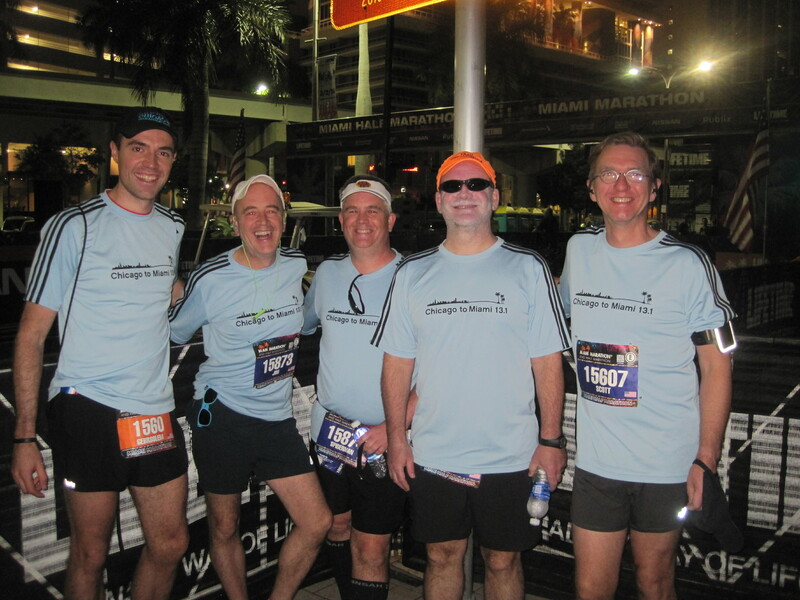 Even the ultras I ran last year were completed with little emotional reaction from me. I cross the finish line, give myself a moment to enjoy the accomplishment, and continue with my life. I’ve never succumbed to any deep emotion at the end of that long journey. Until this race. It was a different experience altogether, one that I won’t forget. I appreciate the kind words.